Video transcript: Today, I want to discuss impostor syndrome. (Note: You’ll also see it also spelled imposter syndrome, or cited as impostor phenomenon or fraud syndrome.) It’s not a new subject, but I’ve seen a big uptick in mentions about it among freelance creatives over the course of the past few months, and a Google Trends search indicates that a lot more people are searching the term. What is imposter syndrome? It’s not just a lack of confidence—it’s the feeling that you’re going to get found out, that maybe you’re not as good as you portray yourself, or that somehow you’re inferior to other people in what you do. 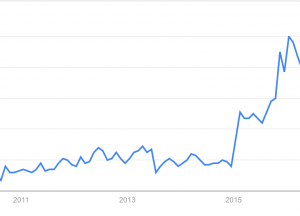 Google Trends: Have we reached peak concern about impostor syndrome? I suspect it’s not an uncommon thing among freelance creatives, because there’s no perfect empirical way to measure what we do. If you’re a baseball player who bats .300, you’re going to be employed by a professional ball club, and if you can build widgets faster, better, and more accurately than other people, that’s an empirical measurement that isn’t as easy to make in creative fields. Part of the reason this came to mind is my experience at IBPA Publishing University in Salt Lake City last week. (If you’re a writer, an aspiring author, working with authors as an editor, or an indie publisher, it’s really worth going to.) 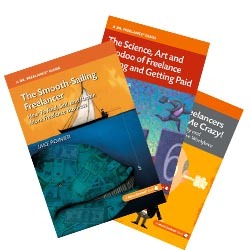 I quickly found that, even though I have decades of publishing and marketing experience, my knowledge in book publishing is relatively shallow. I’ve edited a lot of books in my freelance business, and I’ve written my own books on freelancing, but going to a conference where there are people who have written or published dozens or hundreds of books is a little daunting. The fact that everyone was kind about sharing their knowledge took the sting out of it. Is impostor syndrome common w/ #freelance creatives b/c it’s hard to measure what we do? In some respects, I look at impostor syndrome the way I look at writer’s block. Does it exist? Sure. Does focusing on it accomplish anything? Absolutely not. So you need to think about how to get past that, how to overcome the nagging feeling that you’re either inferior or are going to get found out, that someone will discover you’re not as spectacular as you know you are in your heart. As with writer’s block, what I have an issue with is impostor syndrome being used as some sort of excuse for not going out and trying to accomplish new things and better things, or not experimenting with new adventures. How do you go about addressing those feelings of inferiority? I think with imposter syndrome it comes down to authenticity, whether you’re genuinely striving to achieve and break down barriers, trying to get better than you are today. At Publishing University, they mentioned on the first day that you need to accept where you are today, and move forward from that. You can’t regret things that you’ve done in the past, or haven’t done in the past. That’s part of it. The opposite is the Dunning-Kruger effect. That’s when somebody—and we all know this person—thinks they know everything, and the fact is they don’t realize and can’t evaluate their own ineptitude. In a way, it’s like the Peter principle, someone who self-promotes beyond their capabilities. You don’t want to fall into that trap any more than you want to feel inferior or get found out. Specifically, I think the first thing is recognition of what impostor syndrome is and why you feel that way. Bestselling author and HARO founder Peter Shankman often talks about ADHD and how he uses it as leverage to make his business better and make himself more successful. You need to think about impostor syndrome in a similar fashion. Then, the second aspect of it is recognizing you have control. Nobody can control how you perceive yourself but you. Nobody can make you feel bad about yourself without your permission. Accept that at any given point in time—the way I felt going into a conference with so many experienced, successful people—you’re always going to run into people who know more about a given topic than you do. That’s OK. The key is, what do you do to extract that information and make yourself better? The final aspect is exactly that: taking action. You can’t let those feelings, whether you’re fearful or don’t have confidence or are letting impostor syndrome get in your head, you need to do the things that prove to yourself that you’re capable. That’s really the best way to get around it. You set a goal for yourself, and when you achieve it, you’ll chip away at those insecurities. Obviously, this is just scratching the surface, and there are other factors that you may feel at a deeper level. If you want to read future posts on this topic, click “like,” share this post or video on social media, or comment below about your experiences, and that will be my signal that people want to hear more. Impostor syndrome is not something that will just go away, but it is something to recognize, control, and take action on. In the comments: Do you occasionally—or chronically—feel like you’re dealing with impostor syndrome? How do you manage it? Thanks for opening up the dialogue on impostor syndrome. I feel it every day in the niche writing that I do. I am competing with writers who have vast professional experience or postdoc degrees, yet my comfort level with my niche — visual arts — is increasing every year. So I realize that what I’m doing is what every serious reporter needs to do — embrace unfamiliar topics with vigor and confidence, ask a lot of questions, don’t pretend to be someone you’re not, and then present the stories even better than your competitors by writing them without academic jargon and with journalistic polish. Thank you for the comment, Deborah. From your description, I can understand how that would be an intimidating experience! It absolutely sounds like you’re taking the right approach—and that will pay off. Hi Jake. I know we’ve talked elsewhere, but I just wanted to officially stop by and thank you for recommending my podcast. Princess was an amazing guest. I never expected fear and confidence struggles to be such a fun topic to talk about. I’ve shared a link to your post and your video over on the episode’s show notes page and linked to the post in the blog post announcing it. You’re very welcome, Jenn. I appreciated that you and Princess did such a great job of being honest and open about the topic, and yes, having fun with it. I rarely listen to podcasts all the way through, but your presentation did the trick. And thank you for sharing my post–I’m adding a link back to your show notes.